Blogs are a funny one, aren’t they? They’re one of those primitive relics of the early days of the internet, yet they’ve shown surprising resilience, with some plucky bloggers today outperforming big digital media sites. Animation blogs scratch a very specific itch. One day you might have a hankering for inspiration, on another you’re looking for insight into someone’s life, or career advice, perhaps a tutorial piece or even just a bit of entertainment. With these purposes in mind, I asked the studio what their favourite animation blogs were. Get that ‘bookmark’ button ready, guys. 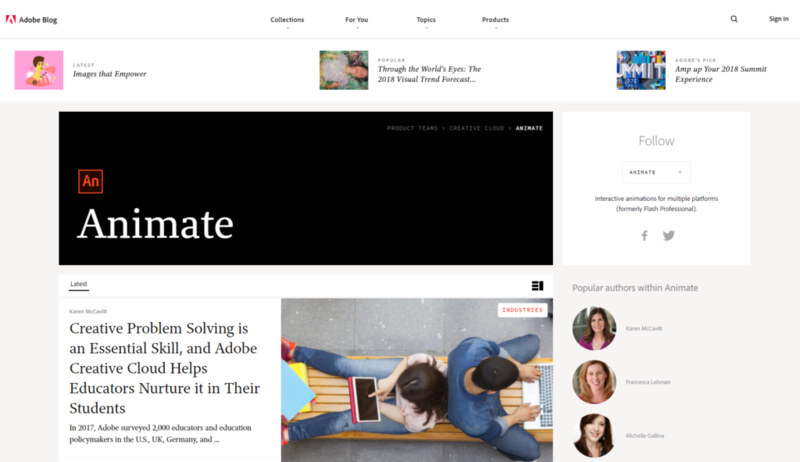 Adobe is at the coalface of digital creative industries, so their product blogs have to prove their dedication and commitment. 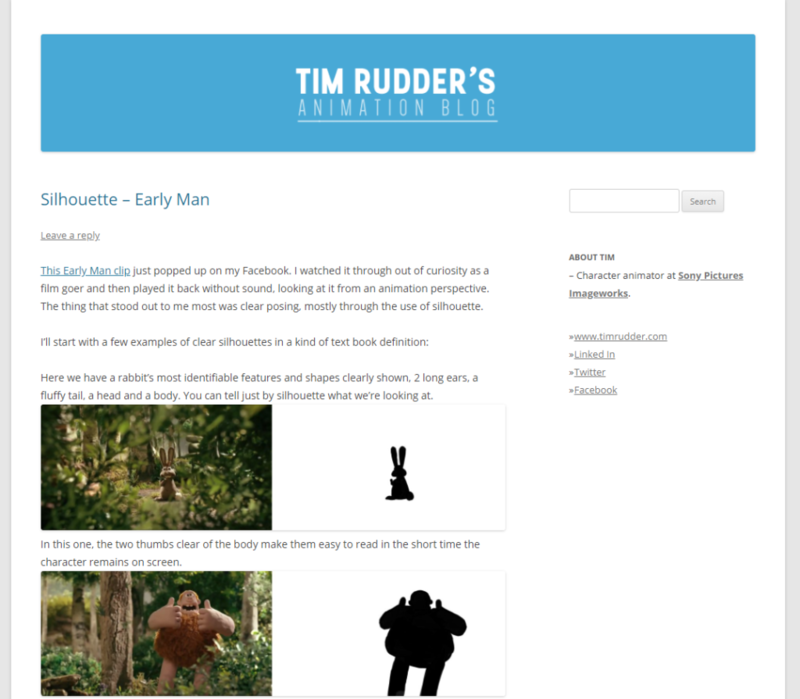 Not only are there product tutorials and update write ups here, you can find inspiring animator showcases and spotlights on specific animations. There’s a little overlap with posts, but check out the Character Animator one too: a must if you’re already floating about in the Creative Cloud. It doesn’t take Sherlock to work out what you’re gonna get from this one judging by the title. This blog boasts a decent number of advanced tutorial-style pieces, with a few sprinkles of analysis and critique throughout. Ricardo loves to get into applied animation. He writes with an engaging confidence, really digging into the techniques that are less talked about but definitely worth a read. Someone’s got to look after the future of traditional animation, lucky for the animation community, these guys have taken to the task with admirable gusto. If you’re a purist, animation historian, or just plain love you some traditional craftsmanship, this is your new home. 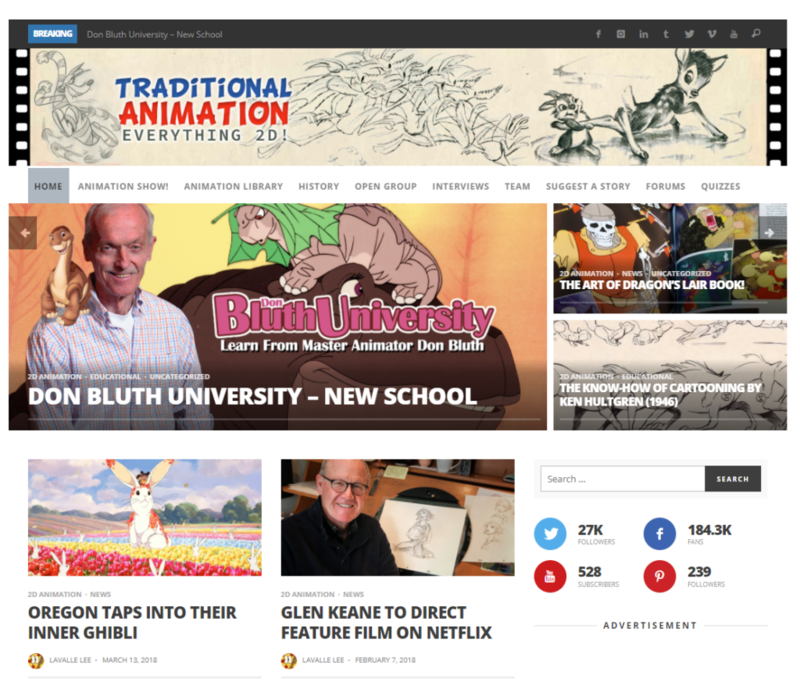 There’s even a history page with a lovingly created timeline of traditional animation from the 1910s, shining a spotlight on prominent traditional animation pieces from every decade up to the 2000s. I love this bit, it’s really fun and informative, showing just how much this art has developed, and why it deserves to be more than just a technique for enthusiasts. Here’s a great blog for all you otakus out there that look east for your favourite animation. You’ve got updates, hot takes and analysis of series like Naruto, Dragon Ball, My Hero Academia, even regular posts about Pokémon Go. Yeah, there are still folks that are well into it! If you’re one of them, check this place out. 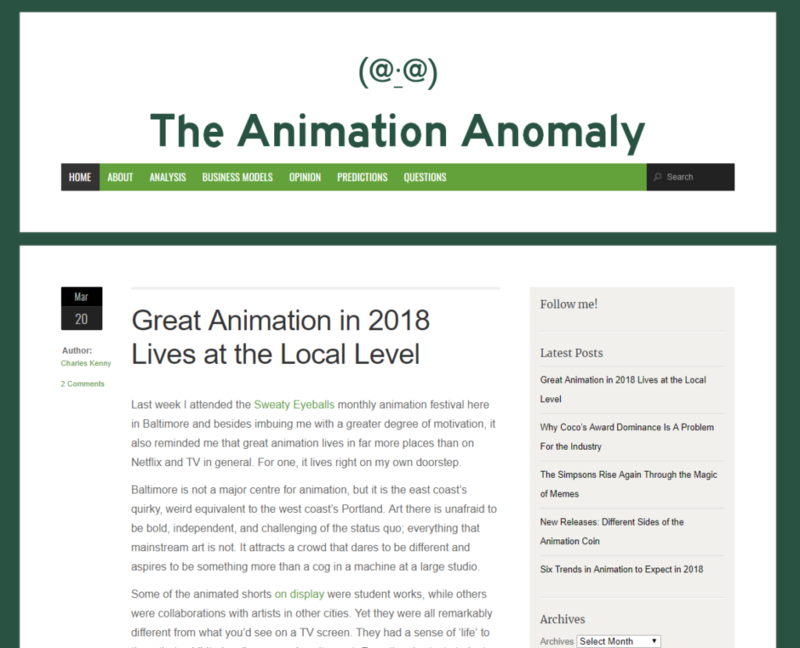 An (almost) daily helping of curated animation inspiration, news, studio ‘behind the scenes’ and other, passionate animation based musings. It’s stylish, well-laid out and thoroughly interesting. It can be really tough to get a leg up in this industry. I admire On Animation for its tendency to give student projects and smaller animators’ work the recognition they’re not often afforded. 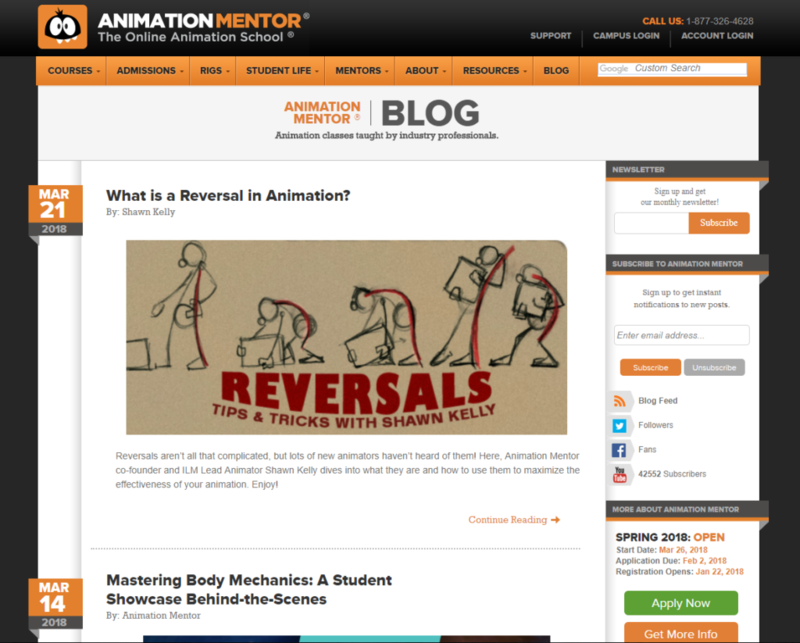 It’s actually pretty rare to find a decent, active, regularly updated animation blog which is run by just one person. For Animation Anomaly, Charles Kenney is that person. He posts thoughtful, critical and insightful pieces on the animation industry as well as on the discipline itself. 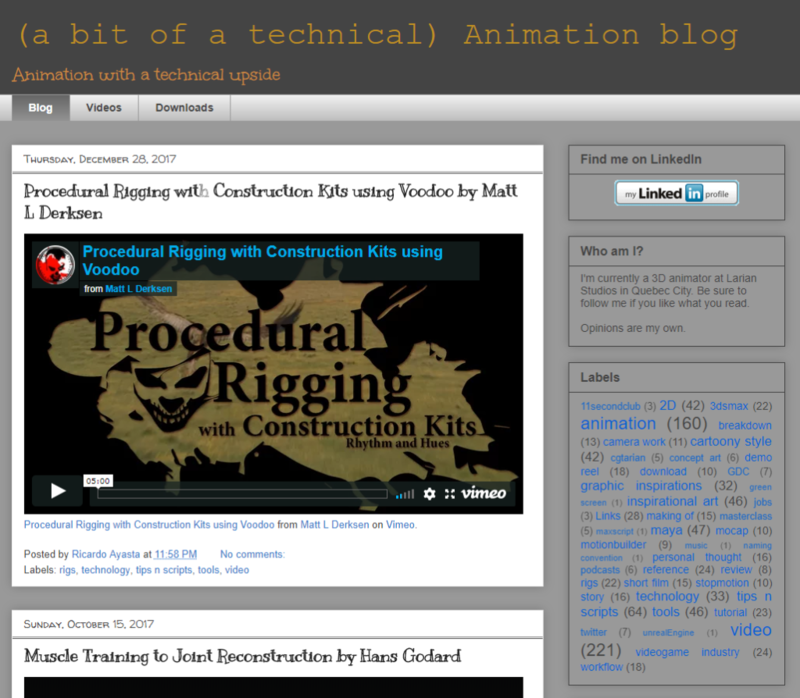 Kenney didn’t start the blog as an animator, he’s actually a civil engineer. As the anomaly himself, he has this refreshing outside perspective, offering great content about how animation as a value proposition, business, and a discipline fits into our developing digital landscape. Their blog is a regularly updated educational resource. There’s tutorials, interviews, thought leadership and talent showcases – a real mixed bag. Their popularity stems from honest, generously given and clearly communicated insights and expertise from mentors that clearly love their discipline. 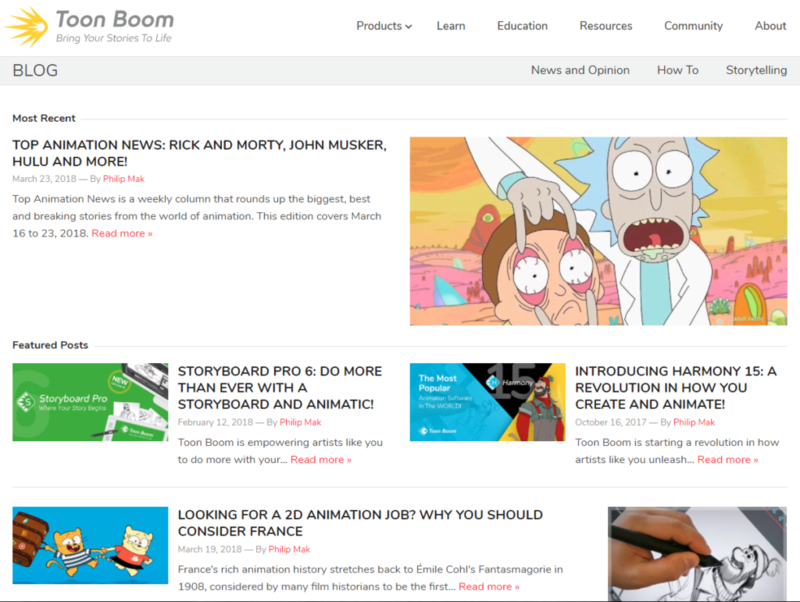 Sure, you can come here for animation news, tutorial pieces and career advice, but you’re constantly being inspired by the huge productions that Toon Boom boasts as users of their tools. Rick and Morty, Bobs Burgers, Arthur, The Simpsons, Danger Mouse, SpongeBob SquarePants, Family Guy, Adventure Time, Clifford the Big Red Dog, Futurama, South Park, Steven Universe. Blimey, writing it all out like that makes you realise how many of the most iconic 2D shows of the last decade have used Toon Boom tools. They really give meaning to the term ‘industry standard’. Don’t roll your eyes though! This highly polished blog is more than just name dropping. They separate their content into ‘News and Opinion’, ‘How to’ and ‘Storytelling’, offering some of the most well-researched, quality animation content out there. Tim is a working character animator at Sony Pictures Imageworks. In his blog you’ll find insightful breakdowns of sequences that catch his eye, tutorials and Sony-related news. Trust me when I say that’s a slippery slope. I hope you’ve bookmarked a few of these, they’re great for that little bit of inspiration on a slow afternoon. If you’re an avid follower of an animation blog we’ve neglected to mention, please let us know, we can definitely squeeze a few more into our lives!